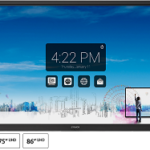 Interactive touchscreens – The Top 5 according to our customers! In the last five years, LED interactive touchscreens have taken the world of tech by storm, but are you really getting the most out of your screen? With so many options to choose from, it can be daunting to even entertain the idea of improving the facilities in your school classrooms. After all, when they all look the same it’s hard to know what their individual features and benefits are, so we are delighted to share the opinions of our education sector clients to help inform your decision on what they deem to be the top 5 screens. With its 10 point touch, the BenQ RM range comes with an anti-bacterial coating made especially for little fingers in education. Boasting a built in soundbar, a built in wall mount on screens up to 65”, a free palletised delivery and additional cash back offer, the BEN-Q is leading the way with affordability. A popular choice for education because it does what it says on the tin, no more, no less. It has a built in android system that will work in conjunction with the SMART Learning Suite your teachers have come to learn and love. As well as its own Oktopus software and Insta-Q Share it has more than enough functionality to keep both the teacher and the class happy and interacting. The SMART interactive range has its name embedded into the market place, with teachers loving the SMART Learning Suite (of SMART Notebook, as you decade loyal users will know it as). Our client feedback shows that SMART definitely has the most popular software out there, but we have seen more repair requests for their hardware. However, the great benefit to buying the SMART hardware is that it comes with very cheap licence deals for the SMART Learning Suite, around £35 a licence compared to £700 for using it with third party screens. Each licence covers four pieces of hardware and discounts are available when you purchase more than five at any one time. 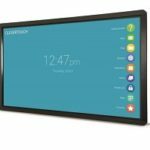 The all singing, all dancing Clevertouch screen is considered to be the elite amongst the LED flat panels with a realm of additional features making it a perfect solution for higher or further education and the corporate world. Unfortunately with all of the extra bells and whistles, it is pricier. 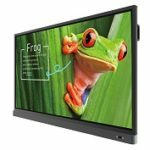 A 65” screen from the Clevertouch Plus range, compared to a 65” from Ben-Q for example, could set you back an extra £1000, but its walk-up-and-use experience can revolutionise the entire classroom set-up. It has a seamless installation and integration process, and free on-site training for the panels is provided. You can see a full list of features here. Looking for a longer warranty? C-Touch will give you 7 years, that’s right, seven! The longest warranty available on the market. 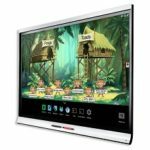 With an integrated wireless presentation system, webcam for meetings, 40 user licences and 2,500 pre-prepared lesson plans the screen goes down a storm in the classroom if the user knows their way around the built in software. In terms of pricing, it’s nearer the higher end of the bracket and closer to some of the Clevertouch panels and the SMART 6000 series but with the additional few years of warranty, the higher price could be justified. The Android operated C-Touch panel comes with built in JBL speakers and a Ximbus cloud solution for Google Drive. Ben-Q. 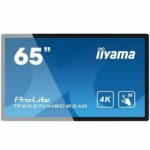 With it’s affordable price-point and fantastic hardware and features, these interactive touchscreens are by far the most popular amongst our customers and we can’t find any reason to disagree with them. Call us on 01923 235 377 or email [email protected] for a chat and a personalised recommendation for your organisation.